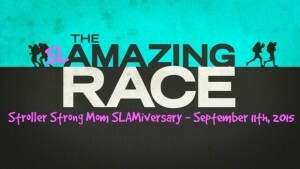 Join Stroller Strong Moms Savannah for their 3rd annual SLAMiversary. You will SLAM Around the World, Amazing Race style. Please wear patriotic attire as this SLAMiversary falls on September 11th and after you will race around the world & will end up in the good ole USofA. Please bring your favorite dish and join Stroller Strong Moms Savannah for a potluck in the park after you Sweat Like A Mother. SLAMiversary is open to all Stroller Strong Moms and as always newcomers are ALWAYS welcome. Stroller Strong Moms has stroller fitness workout classes in Savannah, Richmond Hill, Pooler, Bluffton SC & Port Wentworth. See the class schedule here. 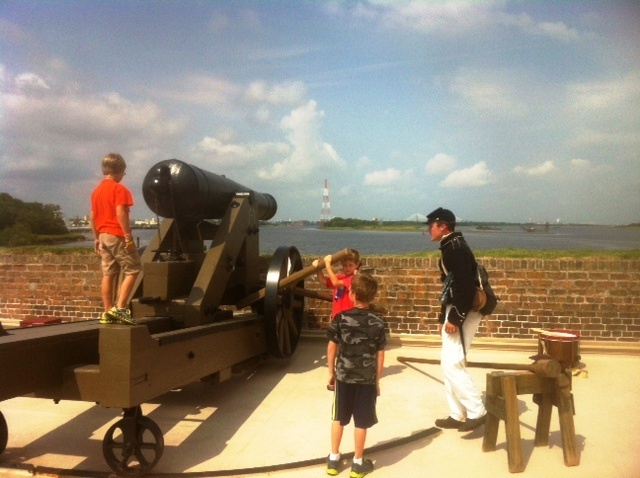 Bring the kids to Old Fort Jackson to participate in a variety of hands-on activities appropriate for all ages to learn about the daily life of the soldiers stationed at Fort Jackson. Activities include marching, battle reenactments, heavy artillery drill, and musket and cannon demonstrations. Learn about the many individuals and units of the of the Revolutionary War, War of 1812, and Civil War that are part of the story of a Century of Sentries at Old Fort Jackson. Fort Pulaski returns to the summer & fall of 1861. Join Fort Pulaski as the 1st Georgia Volunteers garrison the fort with a living history weekend event. From company drill and inspections to artillery demonstrations, immerse yourself in a soldiers life as they live in the casemates of the fort, prepared to protect Savannah and the Confederacy. (912) 786-5787 X114. More details here. Tools & skills that built a colony. See craft demonstrations such as woodworking, blacksmithing, cooking, spinning, flint knapping, leatherworking, woodsman skills, pewter casting and more. Come for old fashioned family fun, Civil War-era games, cavalry demos and prizes. Cannon & musket firings by reenactors. Nationally recognized reptile and amphibian expert, Jason Clark, will have his large trailer display of many native reptiles for you to view. At 11 a.m. and 3 p.m., he will present an informative program on snakes. Cost: $5 children, $8 adults (children younger than 6 are free) plus $5 parking. Labor Day at Fort King George Historic Site, Darien, Ga.
Watch musket & cannon firings, see various jobs soldiers would “labor” on as part of their duties. Labor Day Commemoration @ Fort Morris Historic Site, Midway, Ga.
Commemorate Labor Day w/ hourly soldier talks, plus musket, cannon firings at this coastal fort. Sign up your kids to train for a 5K or 1 mile run and have fun in the process. 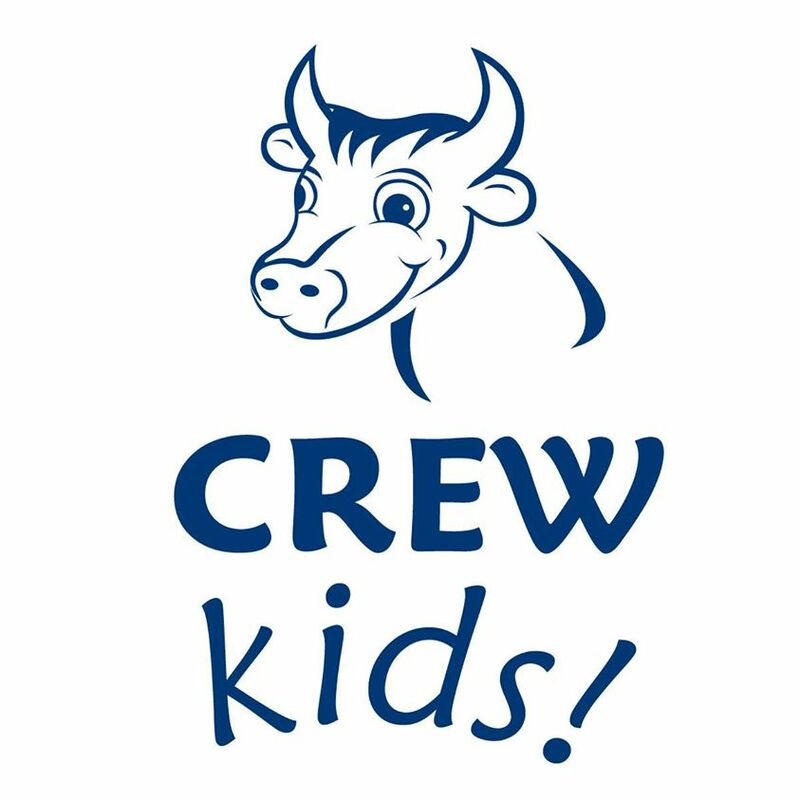 Fleet Feet Savannah’s CREW kids! training program includes running, field games and other fun activities that are perfect for releasing energy. This program will prepare your kids for the Rock ‘n’ Roll Savannah 1 Mile or 5K happening on Sunday November 8th, 2015. This 8-week program will be facilitated by certified coaches who have a passion for encouraging and empowering our younger generation to live healthy, active lifestyles – and they make it fun. 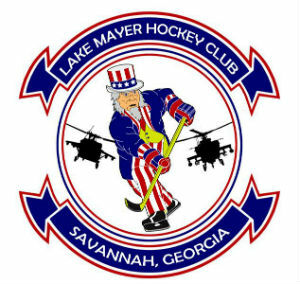 Sign up your child for Youth Roller Hockey in Savannah at the outdoor Lake Mayer hockey rink. The first practice of the new season will be Sat. Sept 12 2015 . Practices will be at 10AM Saturdays through the end of April 2016. Cost: $60, with $40 due at registration and the remainder due by Jan. 1, 2016. The group is organized through Chatham County Parks Services and Savannah Adult Hockey. Registration packets will be available at practice Sept. 12. For ages 5-12 years old. No experience necessary. Learn about required gear & get more details here. Open to all children. Children do not have to be enrolled at Summit Gymnastics to attend. Call 912-921-1034 or email summit.frontdesk@yahoo.com. Call at 912-921-1034 or email summit.frontdesk@yahoo.com to enroll. Scribble Art Studio, Savannah Children’s Museum and Blick Art Supplies in Savannah will do a series of Saturday Halloween themed workshops for all ages called “Hooray for Halloween” during Fall 2015. Kristie Duncan will turn Blick’s atrium into an interactive “Halloween Town” for kids to work in and the Savannah Children’s Museum will provide science experiments while Scribble will be in charge of art projects. These will be reasonably priced, fun workshops at Blick Art Materials, 318 E. Broughton St. Savannah, 31401. For more information, call 912-713-7376 or click here. 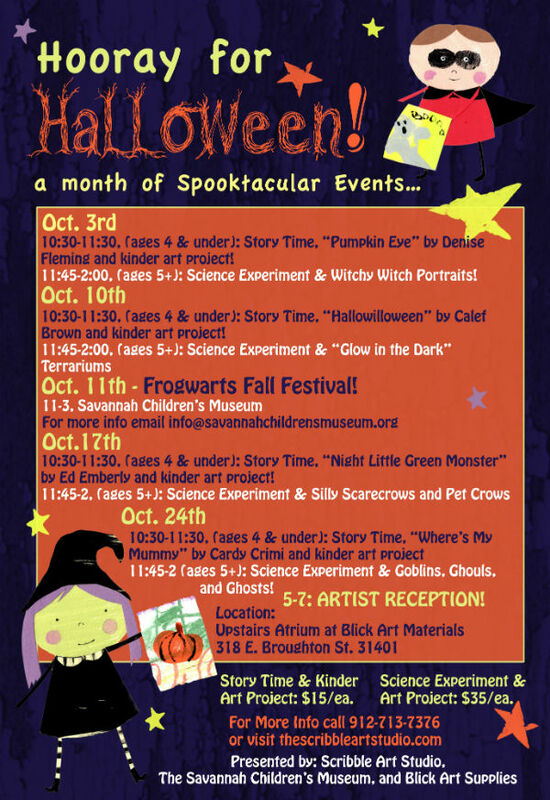 This will be a month of spooktacular storytime, art and science project programs. Science Experiment and Art Project: $35. FOR MORE SAVANNAH-AREA FALL EVENTS, VISIT OUR SAVANNAH FALL FUN GUIDE 2015 HERE. Cheerleading for 3-5 year olds in Savannah. 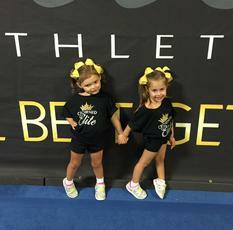 Crowned Elite Athletics – a new Savannah gym owned by the dynamic fitness duo behind Train Me 24/7 Shazi and Drew Edmonds- offers Tiny Team, cheerleading and tumbling for ages 3-5. Classes start Sept. 9 2015 and run until Feb. 24 2016. 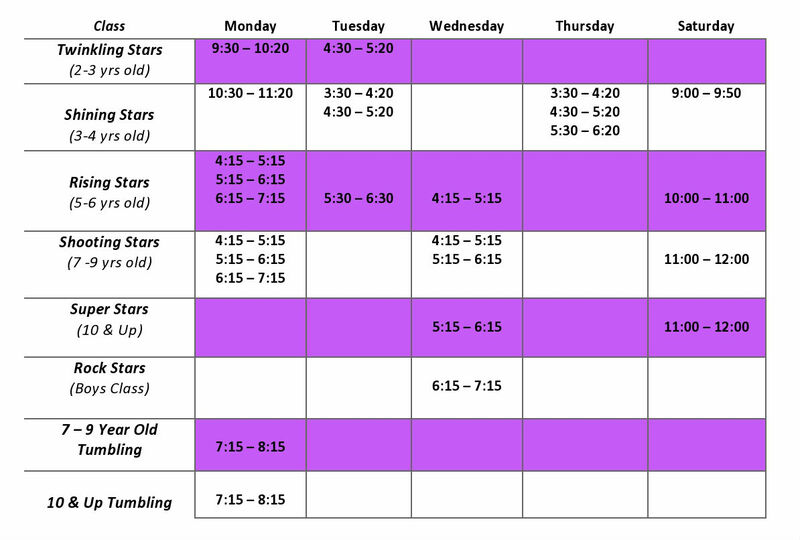 Classes will be Wednesdays at 4PM and a second class at 5:30PM (with the exception of holidays). These tiny future cheerleaders will learn tumbling, cheer motions and stage presence, all while building self esteem and having lots of fun. Register by clicking here through iClassPro parent portal. Cost: $50 Registration and $75 monthly tuition. Like Crowned Elite Athletics on Facebook here to stay connected to all that this Tiny Team has going on. Crowned Elite Athletics’s Shazi Edmonds believes cheerleading is more than just a sport. Shazi says cheerleading creates long-lasting friendships, and teaches kids valuable lessons in teamwork and sportsmanship. Being a part of Crowned Elite Athletics is more than simply joining a team; it is the building of a family. Owner Drew Edmonds, who holds a B.S. in Sports Management from Georgia Southern University, is a certified personal trainer who will also aid in the fitness programming at Crowned Elite Athletics. Give your child’s soccer future a kick start and sign up for Early Goals toddler/pre-schooler soccer with Savannah United. Registration for Early Goals toddler/pre-schooler soccer opens Monday Aug. 31 at 10AM and spots fill up fast. Learn more here. 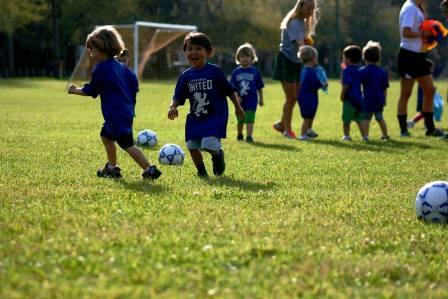 This is a non-competitive introduction to soccer program for ages 30 months to 4 years old. Spots are first come, first served and fill up quickly. Parents are encouraged to sign up as soon as possible. The Early Goals schedule for Fall 2015 is posted online here. Programs are available in Savannah (Daffin Park), Southbridge, Wilmington Island, Richmond Hill and Bloomingdale. The one-session-per-week program focuses on the fundamentals of soccer. Coaches will work on simple coordination, ball familiarity, listening skills, teamwork and hopefully plant the seed for a lifetime of soccer enjoyment. Early Goals program fee: $65 for 6 sessions over 6 weeks. Occasionally, Early Goals will add a $20 facility fee when training takes place indoors. Make Fall 2015 the season your child learns tennis. 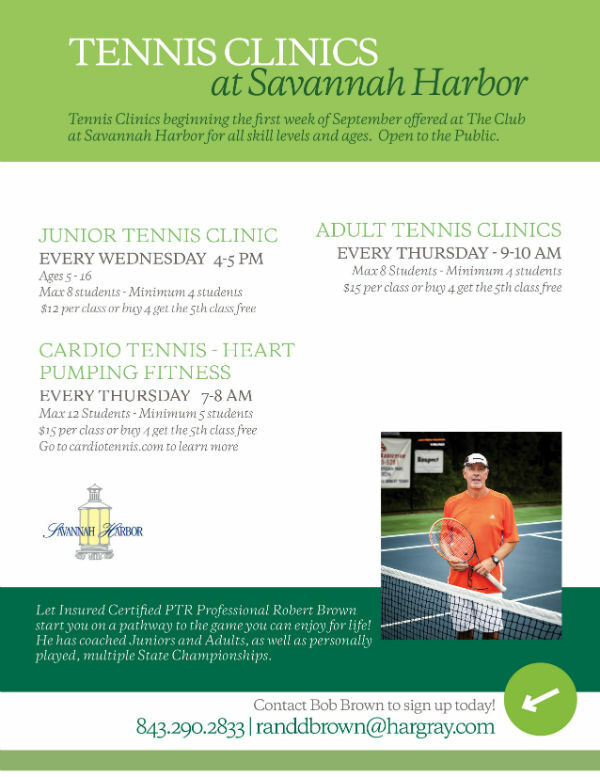 Junior Tennis Clinics for ages 5-16 are offered every Wednesday, 4-5PM @ The Club at Savannah Harbor on Hutchinson Island. Sign up for one class or more. Cost: $12 per class or buy four and get the fifth class free. To sign up, call 843.290.2833 or email randdbrown@hargray.com. The Club at Savannah Harbor, Hutchinson Is., 2 Resort Dr., Savannah, 31421, On Facebook here. 843.290.2833, email randdbrown@hargray.com, www.theclubatsavannahharbor.com The Club at Savannah Harbor is a SouthernMamas.com advertiser. 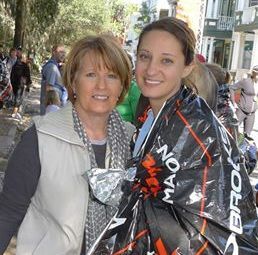 Jessie with her own mama after the Rock n Roll Savannah Marathon. Interested in joining Moms in Training in Savannah? You can! Over the next two weeks, we’ll introduce you to your Moms in Training captains who will be encouraging you during your Saturday mornings runs in Daffin Park. Meet your captains for Moms in Training in Savannah – a social way to get in shape, meet other moms & help fight cancer. Moms In Training includes weekly Saturday morning training sessions (8-9 am at Daffin Park). Meet at the corner of Waters & Washington. Walkers, runners and strollers welcome. Join today for only $25 with coupon code SAVMAMA at www.teamintraining.org/ga or contact Jennie.Brewster@LLS.org for more info. RSVP to Jennie.Brewster@LLS.org or call or 912-436-3273. To learn more about Moms In Training, click here. 5K or Half Relay options. There’s a lot to love about Brighter Day Natural Foods Market in Savannah. 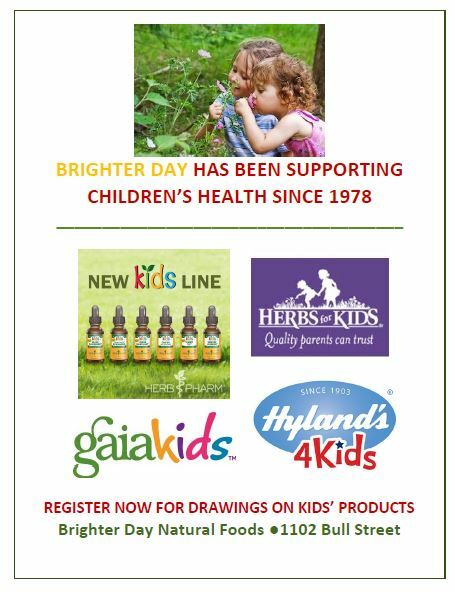 Among them: Brighter Day’s vast supply of children’s herbs & homeopathic products and their 37-year tradition of supporting kids’ health. *15% off Herbs for Kids. Brighter Day owners Janie & Peter Brodhead were engaged when they first opened the store in 1978. And three children and two grandchildren later, they know a lot about children’s health. Shop local. Shop Brighter Day Natural Foods Market. Brighter Day Natural Foods Market, 1102 Bull St., Savannah, 31401 912.236.4703, www.brighterdayfoods.com, On Facebook here. On twitter here. Brighter Day Natural Foods Market is a SouthernMamas.com advertiser. Jumping Jacks of Savannah indoor play center offers these weekday specials. Monday Madness: Bring the kids today & Jumping Jacks of Savannah will match their game cards up to $10. Wonderful Wednesdays: Come in for a free ride on their motion theater. Terrific Thursday : Mention this post & get a free game of bowling. Family Fun Friday: Buy three games of laser tag get one FREE. Jumping Jacks is a locally-owned fun center with huge inflatables, over 50 arcade games, mini-bowling, laser tag, a large concession counter and the best redemption counter in the Savannah area. Like their Facebook page here to stay connected about their specials. FOR DETAILS ON JUMPING JACKS BIRTHDAY PARTY PACKAGES & DISCOUNTS, CLICK HERE. Jumping Jacks, On Facebook here. 5918 Ogeechee Rd, Savannah, Georgia 31419, 912-920-2474, email jumpn.jacks@yahoo.com, On Twitter here, www.jumpingjacksga.com Jumping Jacks is a SouthernMamas.com advertiser. 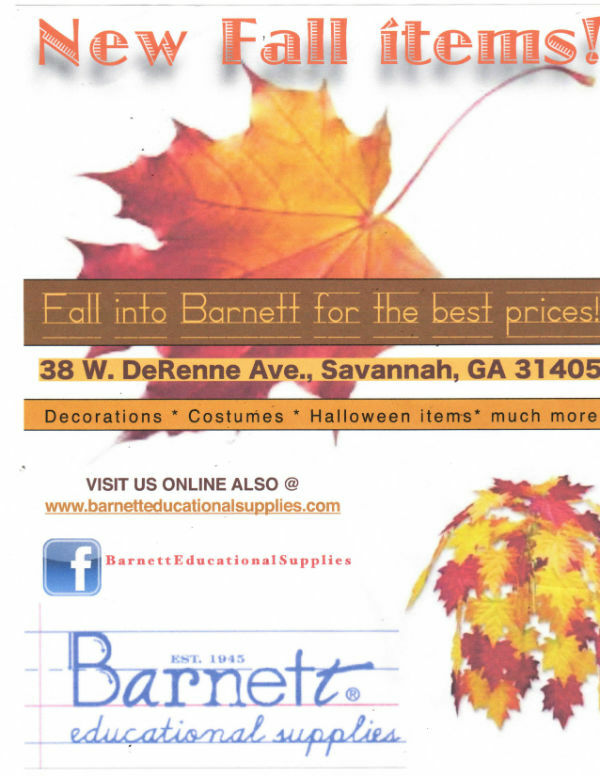 Barnett Educational Supplies in Savannah is your go-to spot for Halloween costumes & Fall decorations. Shop local. Shop Barnett. Barnett is celebrating 70 years of serving the Coastal Empire. Please like Barnett on Facebook here to stay updated on their sales. Barnett Educational Supplies, 38 W De Renne Ave., Savannah, 31405-6742, tel: 912-356-1878, email barneduc@bellsouth.net www.barnetteducationalsupplies.com , Barnett Educational Supplies is a SouthernMamas.com advertiser. Kindermusik in Savannah with 88 Keys Piano announces brand new classes for September. Babies ages 0’s and 1’s will be exploring the theme, “Bluebird, Bluebird”, toddlers ages 2-4 will begin “Up in the Sky”, and preschoolers ages 4-5 will explore the world of keyboard instruments with “All Keyed Up”. 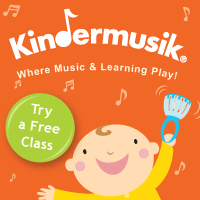 Kindermusik’s “family class” for newborns to 7 meets on Saturdays at 9:30AM. Online enrollment is now available at 88keysga.com or by calling 912.988.KEYS (5397). First class for visitors is FREE. September’s musical monthly playdate, “This is My Dance”, will be held three times – September 21, 23 and 26. Visit www.88keysga.com/kindermusik for more info. It’s Kindermusik…where music and learning play. Put this on your Fall 2015 Must-Do list: Visit Poppell family farms, a 10-acre corn maze labyrinth & activity-packed farm in Odum about six miles from Jesup . Poppell Family Farms pumpkin patch, corn maze, hayrides, giant outdoor jumping pillows, barnyard & farm games & activities are open every weekend Oct. 3 -Nov. 2. 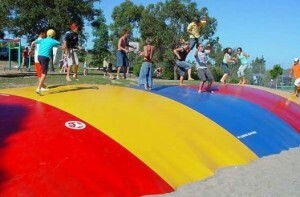 Take a hayride to Charlie Brown, Lucy, and Linus in the pumpkin patch, get lost in the corn maze, ride the cow train, feed animals in the petting farm, try steer roping, Spyder Slyder and the all-time kids’ favorite, two crop hoppers, which are giant jumping air pillows that have kids giggling upon their first bounce. PICNIC AREAS are available for use, so bring your own food or visit Poppell Farms’ CALF-A CONCESSION STAND for hamburgers, hot dogs, sausage dogs, chicken sandwiches & fries. Candy, popcorn & treats available. 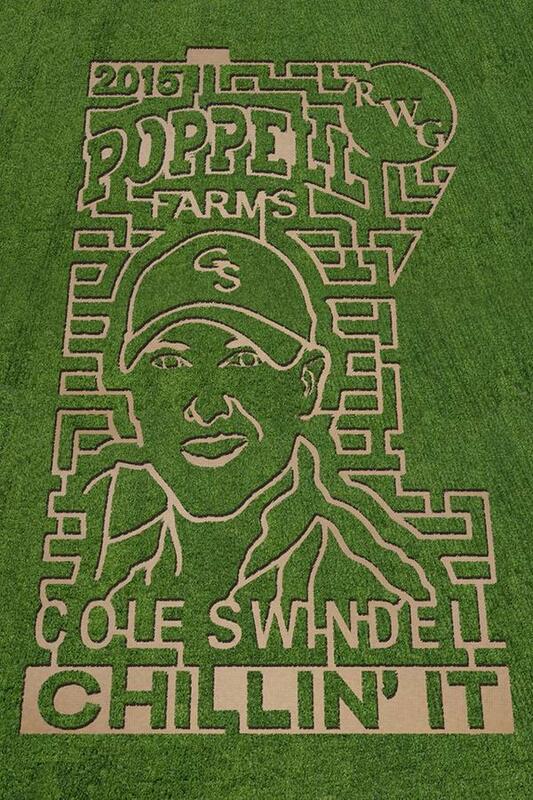 Poppell Farm’s Fall 2015 10-acre corn maze design depicts country music singer/song writer and south Georgia native Cole Swindell. Poppell Farms is open on Sundays, too, for those whose Saturdays are packed with kids’ sporting events. Tickets. For ticket prices, click here. Chick-fil-A Day Come and enjoy the day with us and meet and have your photo taken with the Chick-fil-A cow! This is a Christian based 800 foot walking trail through the woods with real life, in your face terrifying scenes. An alternative to traditional Haunted Houses or Trails. Make the most of this beautiful season in Savannah & the Lowcountry. 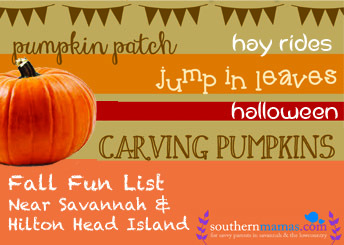 Visit the SouthernMamas.com Fall Fun 2015 Guide throughout the season by clicking here to find pumpkin patches, fall festivals, Halloween fun & more. This Fall Fun list for the Savannah, Pooler, Hilton Head Island area will be updated throughout the season.